MAPHUNGWANE, Swaziland, Jun 15 2013 (IPS) - The overcast sky is a sign that it might rain, and Happy Shongwe, a smallholder farmer from rural Maphungwane in eastern Swaziland, is not exactly happy. Inside a roofless structure made of cement blocks sit different types of legumes – peanuts, jugo beans, mung beans, cow peas and ground nuts – which she has placed in separate containers. The unfinished structure is where she keeps her harvest for drying, before taking the legumes to the storage containers. 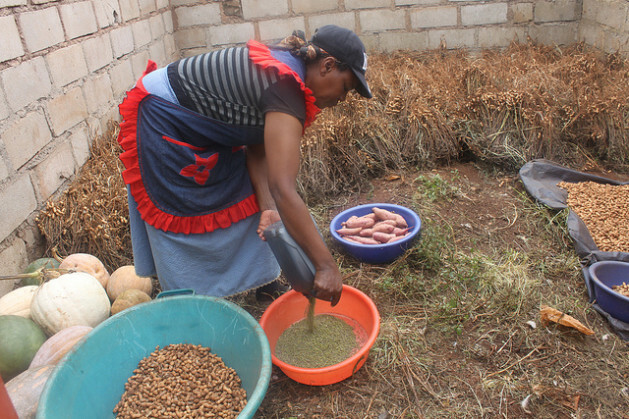 An award-winning smallholder farmer who cultivates nothing but legume seeds for planting, Shongwe says the crop is drought tolerant and grows well in the dry parts of the country. She is preparing to take samples of her harvest to the Ministry of Agriculture’s Seed Quality Control laboratory for testing. If her seeds are of good quality, then she’ll package and label her stock before it is ready for sale. “I get a certificate that shows that my seeds germinate at the required standard, therefore good for planting,” explains Shongwe. One of her major clients is the Food and Agriculture Organisation (FAO) of the United Nations. FAO buys the seed for the organisation’s demonstration plots to promote conservation agriculture. “FAO has placed an order of one tonne of ground nuts from this harvest which we are supposed to supply by September,” says Shongwe. On her own she cannot supply such a big order from her four-hectare farm, so she works with a group of 10 women calling themselves the Lutsango Palata Cooperative. In fact, she chairs the association of women she has mobilised herself to go into seed production. “We make a lot of money from selling the seed inputs compared to farmers who sell for food,” says Shongwe. The National Maize Corporation buys a 50kg bag of maize at 13 dollars while a 5kg bag of nuts sells for 14 dollars. There are about 10 associations of women doing similar work, bringing the number of farmers in this project to over 100, all from the drought-stricken Lubombo Region. These farmers produce indigenous seeds which they sell within their communities before offering them countrywide. “It used to be very difficult for farmers to come across seed inputs for legumes because these are marginalised crops,” according to FAO assistant representative Khanyisile Mabuza. Mabuza said FAO asked the Ministry of Agriculture to train women farmers in seed production and entrepreneurship back in the 1990s when the drought started. In 2008, FAO introduced Input Trade Fairs (ITF) where poor farmers received 72 dollars in vouchers from FAO to buy farming inputs. “The community-based seed producers were also invited as vendors at the ITFs and that is where more women started joining in,” Mabuza tells IPS. In the Kingdom, she says, legumes are considered “women’s crops” and men ignore them. As a result, there was a deliberate effort by FAO to target women to grow seed for themselves for these marginalised crops, which are very important in balancing the diet. “Women also form the majority of farmers and it makes sense to ensure that women have enough inputs to do their farming,” says Mabuza. She adds that there was a deliberate effort by FAO to target the dry areas, because legumes tend to withstand drought. For many years, farmers have been persistent in their cultivation of maize, which is the country’s staple food, although they received no yield because of the drought. “We want our farmers to understand that because of climate change, drought is going to be a part of their lives and they must now learn to adapt,” according to Mabuza. Farmers from the drought-stricken areas can sell their legumes so that they can afford to buy maize from their counterparts based in wetter areas. “We’re very happy with the progress these women farmers are making,” says Mabuza. The community-based seed producers are providing an alternative to the escalating costs of hybrid seed products sold by two multinational companies in the country, Seed Co. and Pannar. According to Seed Quality Control operations manager, Chris Mthethwa, many subsistence farmers do not have enough resources to buy the expensive hybrids. “The advantage with indigenous seeds is that you can replant their offspring, yet that is not possible with hybrids,” according to Mthethwa. He said the big companies are also reluctant to sell indigenous seeds because they are not as profitable as their hybrid counterparts. That is why the government, with support from FAO, decided to mobilise smallholder farmers to produce the indigenous seeds, whose taste many Swazis prefer. There is a possibility that seeds from the smallholder farmers will be exported under the Food Agriculture and Natural Resources Policy Analysis Network (FANRPAN) Harmonised Seed Security Programme (HASSP). Swaziland is among four countries in this programme – Zambia, Malawi and Zimbabwe – working on aligning their seed legislation with the Southern African Development Community (SADC) Seed Regulatory System. According to HASSP programme manager Dr. Bellah Mpofu, this pilot project will ensure easy movement within the SADC region of seeds produced from the participating countries. “This will improve the access to and availability of quality seed to smallholder farmers,” he tells IPS. This means by the end of the project this year, Shongwe, who won the 2011 FANRPAN Civil Society Policy Movers and Shakers Award, can expand her customer base. “I can’t wait to start exporting,” she says proudly.